Be the first to share your favorite memory, photo or story of Annetta. This memorial page is dedicated for family, friends and future generations to celebrate the life of their loved one. Annetta Ferguson Hammond, 83, daughter of Ralph & India (Ferguson) Merical, was born September 15, 1935 in Des Moines, Iowa. She passed away Tuesday, January 15, 2019 at the New Homestead in Guthrie Center, Iowa. She graduated from Redfield High School. On September 20, 1953, she married Delmar "Lucky" Hammond. To this union two children were born, Deborah & David. They lived in the Redfield & Wiscotta area for 40 years. She worked on the assembly line for AMF from 1966-1976, when she retired. Annetta trusted the Lord Jesus Christ as her savior and attended Hilltop Bible Chapel in Redfield, which was started by her mother, India Merical. She spent many years helping with the Joy Club and sharing her love of Jesus with others. 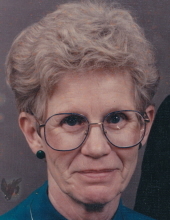 She enjoyed her grandchildren and great-grandchildren immensely. Some of her favorite things to do were quilting, reading, and trips to Arizona with Lucky, Patty & Dave, and Nadine & Willie. Annetta is survived by her children, Deb (Darwin) McCurdy of Linden and Dave (Rose) Hammond of Dexter; 10 grandchildren, 21 great-grandchildren, 5 sisters, and 2 brothers. She was preceded in death by her parents, husband Lucky, a granddaughter, a great-granddaughter, 3 sisters, and a brother. Funeral services will be 11:00 A.M., Saturday, January 19, 2019 at the Hilltop Bible Chapel in Redfield. Burial will be in the Wiscotta Cemetery, Wiscotta, Iowa. Visitation will be Friday, January 18, 2019 from 5-7 P.M. at the Twigg Funeral Home, Panora. To send flowers or a remembrance gift to the family of Annetta Ferguson Hammond, please visit our Tribute Store. "Email Address" would like to share the life celebration of Annetta Ferguson Hammond. Click on the "link" to go to share a favorite memory or leave a condolence message for the family.